Messier 4 (M4) is a bright globular cluster located in the southern constellation Scorpius. It lies at an approximate distance of 7,200 light years from Earth and has an apparent magnitude of 5.9. The cluster has the designation NGC 6121 in the New General Catalogue. M4 was discovered by the Swiss astronomer and mathematician Jean-Philippe Loys de Chéseaux in 1746, who added it to his catalogue as number 19. Charles Messier catalogued the cluster on May 8, 1764. 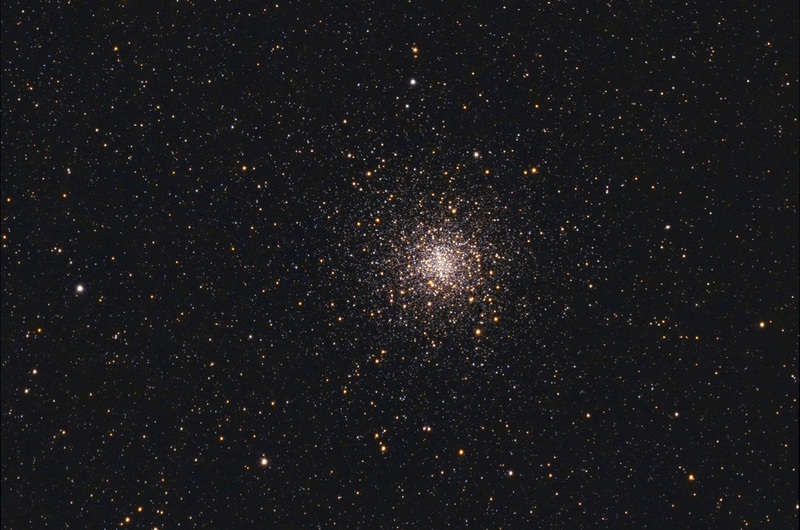 M4 was the first and only globular cluster to be resolved into individual stars by Messier himself. Other globulars in the Messier catalogue were not resolved until about 20 years later, when William Herschel observed them in his larger telescopes. 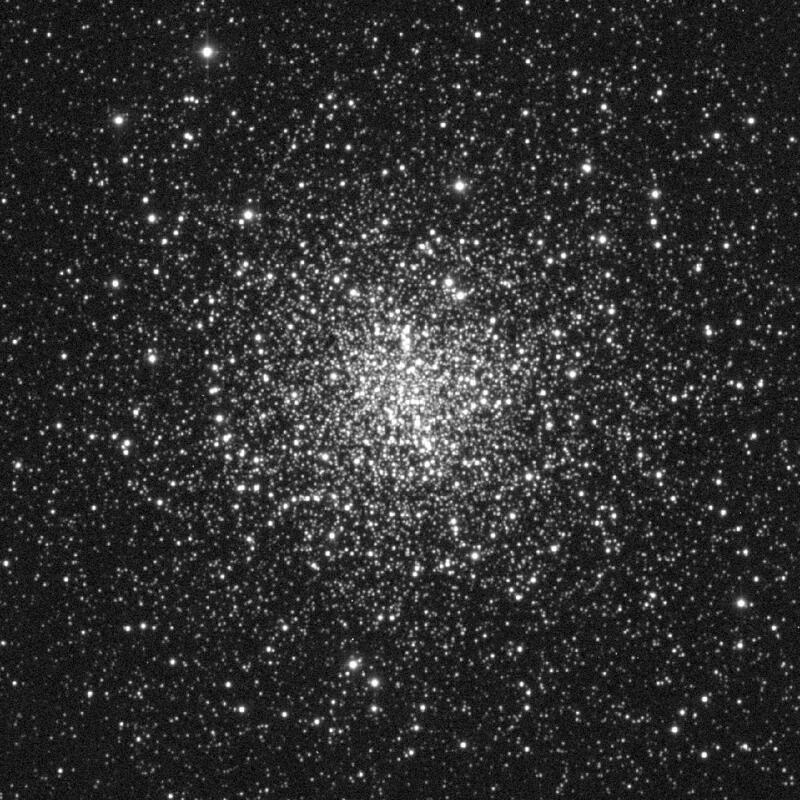 Messier 4 is one of the nearest globular clusters to Earth, along with NGC 6397, a cluster located in the constellation Ara, the Altar. NGC 6397 lies at approximately the same distance (7,200 light years), but is slightly fainter than M4, with a visual magnitude of 6.68. The recently discovered FSR 1767, another globular cluster in Scorpius constellation, lies even closer to Earth, at a distance of only 4,900 light years. Messier 4 has a density classification IX, which means that it is rather loosely concentrated. (The densest clusters are those classed I.) The cluster has an estimated age of 12.2 billion years. M4 has a characteristic bar structure across its central region which can be seen in a medium-sized telescope. The bar is roughly 2.5′ long and consists of 11th magnitude stars. A compressed mass of very small stars, in the middle of the creature’s body, with outliers and a few small stellar companions in the field. The place is carefully differentiated with Antares; from which it is only 1deg 1/2 distant to the west. This object is elongated vertically, and has the aspect of a large, pale, granulated nebula, running up to a blaze in the centre. It was discovered by Messier in the year 1764, and duly reported in the Connoissance des Temps. In 1783, Sir William Herschel resolved this object into stars; and gauging it by a modification of the method which he applied to fathom the Galaxy, he concluded that his 10-foot reflector, having the power to show stars exceeding that of the eye 28.67 times, gave the profundity of this cluster of the 344th order. He describes it as having a ridge of eight or ten pretty bright stars, running from the middle to the nf [north following, NE]; a description which I found very correct. 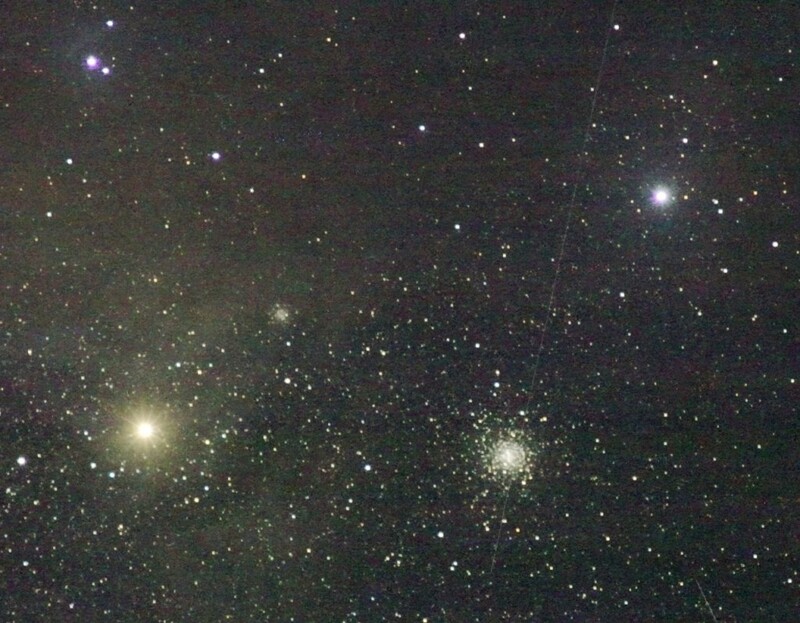 Messier 4 is one of the easiest clusters to find in the night sky and can be seen even in small telescopes. It lies only 1.3 degrees west of Antares, the brightest star in Scorpius constellation and the 17th brightest star in the sky. Observers can see both the red supergiant star and the cluster in a wide field telescope. 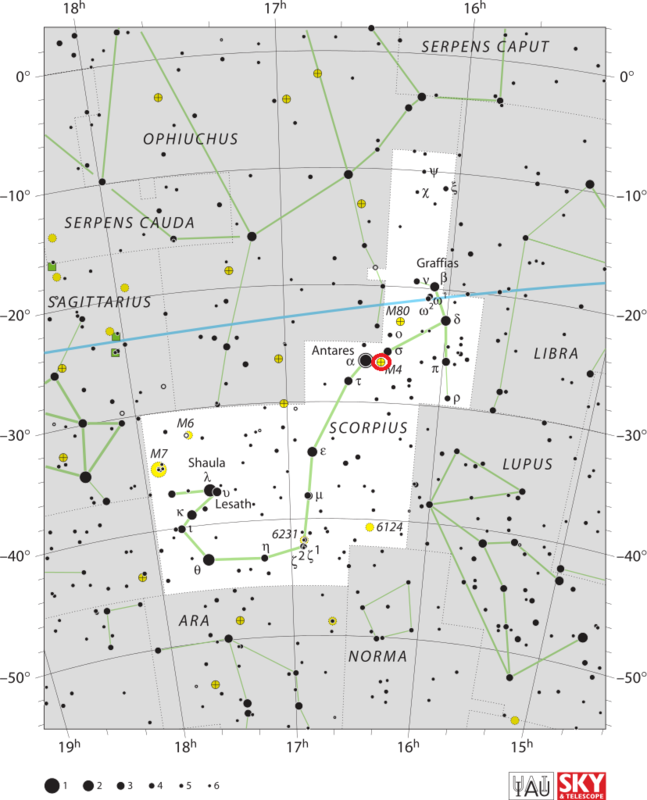 The best time of year to observe M4 from northern latitudes is in the summer months, when Scorpius is visible above the southern horizon in the evening. From southern latitudes, Scorpius is best seen during the months of May, June and July, when it rises high in the sky. Messier 4 has roughly the same apparent size as the full Moon. It is visible to the naked eye, but only in exceptionally good conditions. If it weren’t obscured by clouds of dark interstellar dust, the cluster would appear far brighter. In 10×50 binoculars, the core region appears quite bright and is surrounded by a halo of light. 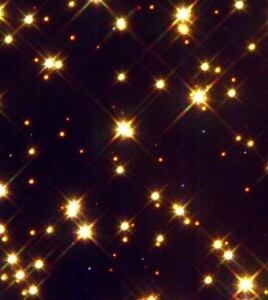 In small instruments, M4 appears as a fuzzy patch of light, while medium to large telescopes reveal individual stars and the central bar structure. 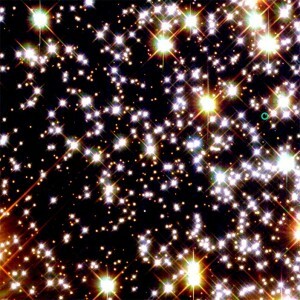 The cluster’s overall spectral type is F8. In deep images, M4 has an angular diameter of 36 arc minutes, corresponding to 75 light years, while in regular images the cluster appears a bit smaller, at about 26 arc minutes. The tidal radius of M4 is estimated at 32.49′, corresponding to about 70 light years. In other words, the stars within the region of 140 light years in diameter that M4 occupies can’t escape the cluster’s gravitational influence. 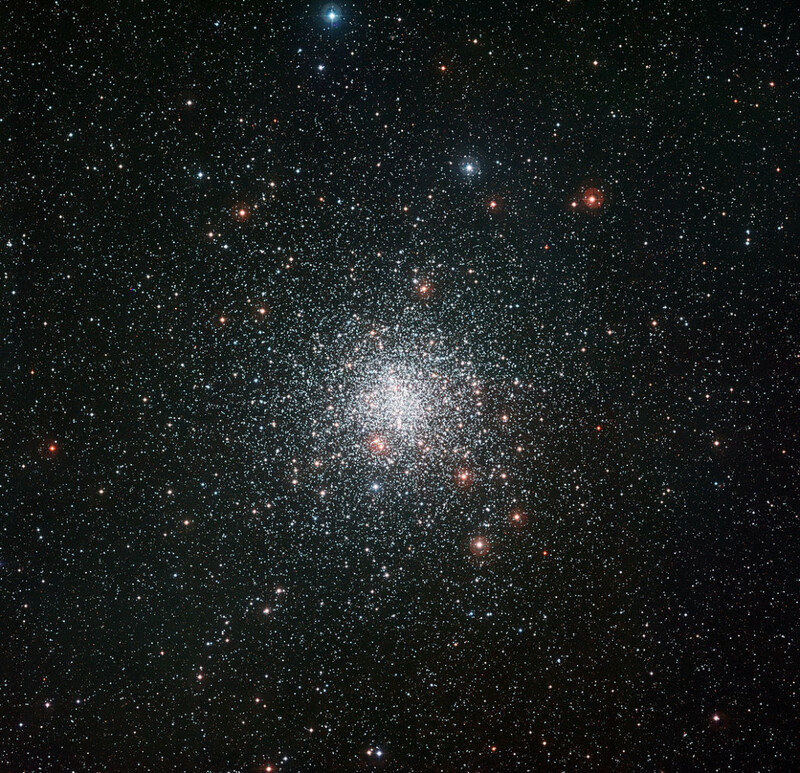 Messier 4 is relatively small and has fewer stars than other globular clusters. Some of the other bright globulars contain up to 500,000 or more stars. The brightest stars in M4 have an apparent magnitude of 10.8. The cluster contains at least 65 variable stars. It is believed to host at least two distinct stellar populations, which is to say populations of stars formed at two or more different points in time. 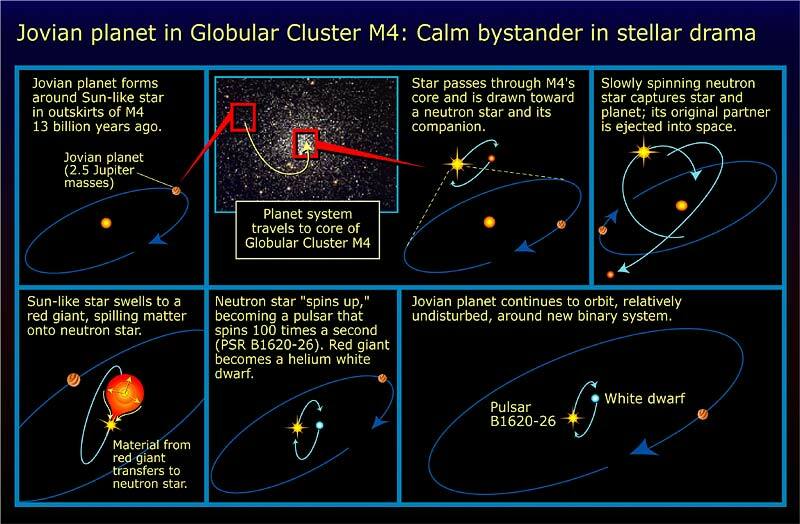 If this is the case, the cluster underwent two or more cycles of star formation. 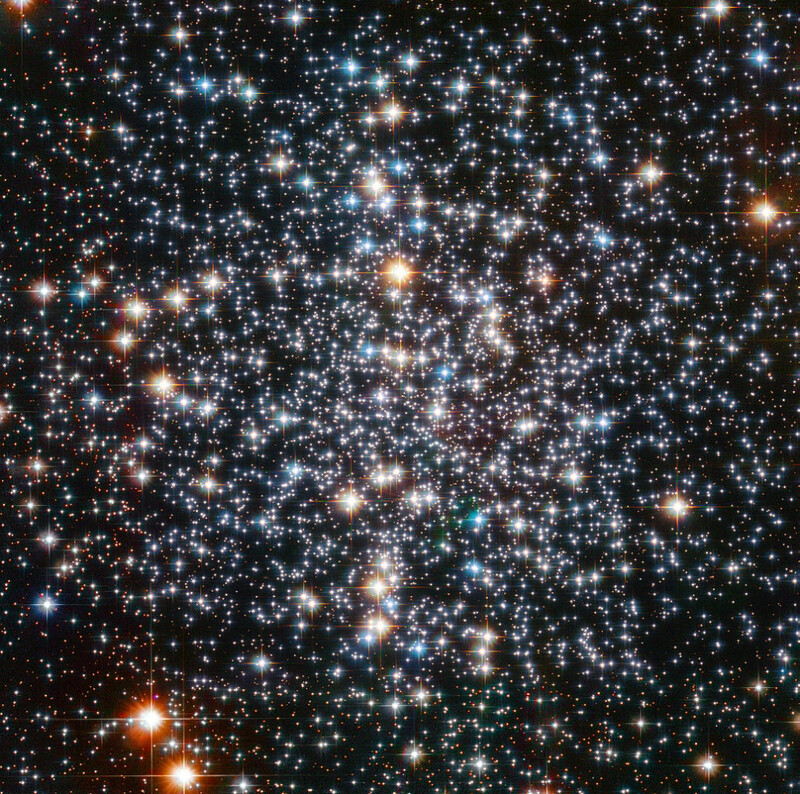 Messier 4 contains several tens of thousands of stars, but it may have been more massive and contained more stars in the past. The cluster has an orbit that takes it through the Milky Way’s disk, at distances less than 5,000 parsecs from the galactic nucleus. As a result, M4 undergoes tidal shock every time which, in turn, results in repeated loss of stars. Messier 4 is receding from us at 70.4 km/s. It has an estimated mass of 100,000 solar masses. Half the mass of M4 is concentrated in the cluster’s inner region, spanning 16 light years in diameter. Messier 4 is home to some of the oldest known stars in our galaxy. With an estimated age of 13 billion years, the white dwarf stars found in M4 in 1995 are the cores of ancient stars that lost their outer layers a long time ago. About 15 percent of the stars in M4 are binaries. Hubble Space Telescope image of the location of the pulsar B1620-26, which is orbited by both a white dwarf and a Jupiter-sized planet. Credit: NASA and H. Richer (University of British Columbia). In a recent survey of the cluster, one of the stars was discovered to have an unusually large amount of lithium, an element that is usually destroyed over a star’s lifetime. The unusual star has either retained its original lithium or produced a new supply. The source of the element is still unclear. In July 2003, astronomers discovered a planet in the cluster. The planet has 2.5 times the mass of Jupiter and orbits a binary star system consisting of a white dwarf and a pulsar (rapidly rotating neutron star). The binary system, designated PSR B1620-26 lies at a distance of 12,400 light years from Earth, just outside M4’s core region. The planet, PSR B1620-26 b, has the unofficial nicknames “the Genesis planet” and “Methuselah” because it is believed to be 12.7 billion years old. It is one of the oldest extrasolar planets known, roughly three times the age of our solar system. A milisecond pulsar, PSR 1821-24, was discovered in Messier 4 in 1987. It has a period of 3 miliseconds, which is roughly 10 times faster than the Crab Pulsar in Messier 1.